Show off your spike during a friendly game of pool volleyball. Kiddos get their own pool and play area where there's no limit to the fun. Kids and grownups alike will love the onsite putt-putt golf course. Challenge the kids to a game of air hockey - winner gets to pick what's for lunch. Exercise enthusiasts rejoice! The fitness center has everything you need to work up a sweat. The resort has 5 outdoor pools with several water features and a special pool just for kids. Grandview at Las Vegas is far enough away from the Strip to enjoy the peace and quiet that the resort location offers and yet close enough to experience all of the excitement that Las Vegas is known for. Once you get settled into your condo, get ready to pool-hop your way through all five options. Get everybody sun-screened up and hit it. There’s a separate kid’s activity pool to keep the splash zone somewhat contained. Lounge poolside with a cocktail and a magazine while the kids play Marco Polo. Now the only question is – margarita or mai tai? If you're up for a soak in the hot tub, there are five to choose from. Go ahead and try all of them – after all, you’re on vacation. Get your cardio on at the fitness center. Challenge the kids to a game of putt putt golf, located onsite. Or visit the activity center for air hockey, pool and arcade games. Grandview at Las Vegas is located adjacent to South Point Casino which has video poker, slot machines and table games. It also has a 64-lane bowling alley, a movie theater and restaurants. For a more classic Vegas experience, take advantage of the shuttle service to the Strip. Check out the famous musical fountain show at The Bellagio, try your luck at the casino at Caesar’s Palace or visit The Colosseum to see a show or concert. 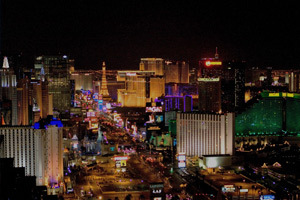 Vegas icons like Mandalay Bay, MGM Grand and the Venetian are also close by and definitely worth a stop. The resort’s Concierge could quickly become your new best friends. They’ll happily assist you with reserving a table at the best restaurants and booking tickets to fabulous shows like Cirque du Soleil or The Blue Man Group. Shopaholics, rejoice! The Grand Canal Shoppes at The Venetian and The Palazzo, The Forum Shops at Caesar’s Palace and The Miracle Mile Shops at Planet Hollywood offer all of the shopping you could ever hope for.